These slides were created to fit virtually any size swimming pool. With a low-profile, compact design; these slides are the perfect way to add some more excitement to your pool. Contact: SR Smith and Interfab for more slides, diving boards, and water sports equipment. Another nice feature are the LED colored lights by PAL lighting. The beauty of your pool comes alive when the sun goes down. The Fiberstars lights change colors and set a very relaxing mood to your pool. You can add character and style to your fiberglass pool with coordinated perimeter and inlayed tile. 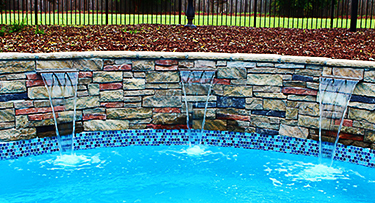 Perimeter tile is installed along the outer perimeter of your pool and is available in a multitude of color and designs. Pricing varies depending on your tile selection. To view more samples visit the NTP Tile Collection website. Fencing: Traditional styles that are affordable. Salt Generators: Never Buy Mix or Measure Chlorine Again! Salt Chlorine Generators makes owning a pool fun and healthy with its convenient purification. Chlorination that's easy to live with and water that’s silky, smooth, and refreshing, automatically. Heaters: Heaters to keep you comfortable all year long. Automatic Safety Covers: Automatic safety covers, you can have peace of mind knowing that your pool is protected when you are not there, it takes less than one minute to cover and uncover. Mesh Safety Covers: Mesh safety covers to fit any pool size, shape or budget. 15 year warranty. Ionization System: We also offer an ionization system by Intec-America that give you a chlorine free pool, it's like you are swimming in clean purified bottled water. Any other feature you need!